I’m thinking of doing a mini-comic based on a guinea pig who wants to conquer the world. His human companion, Jon, is a cartoonist who loves superhero comics. This has inspired the guinea pig, called Pigguin, to become a super villain and conquer the world, in his secret identity of Dr. Incognito. The idea started with the sketch of the cartoon hamster on the top left. After I made a side view, I remembered once saying in a chat on Ustream with Canadian cartoonist Jonathan Rector, while feeding his girlfriend’s guinea pig, that he should do a mini-comic about the little guy. Since Jon is all wrapped up in work as an independent illustrator and his own mini-comic, about Jesop King, I decided to do this mini-comic about the guinea pig myself. Mind you, just about 30 minutes ago or so. Sometimes things go faster than a speeding bullet. Thanks for stopping by and reading my blog post. Definitely check out Jonathan Rector’s website or follow him on Twitter (artbyjar). I’m exploring the point of failure in drawing. At what point am I giving up and why? Why in blazes do I want to bother about failing? Isn’t success much more important? Simply put, I want to improve my process. The best way to do that is to fail often and fail early and then revise where you want wrong. Since the above drawing is my warmup sketch, I didn’t give a dang about structure. I took a random ad from my TV guide and started drawing top to bottom. There was some structure, but not much. Warmup is all about getting the bad drawing out of your system, so what follows is pure gold (one hopes). And then it happened. The magic was lost. I saw so many mistakes on top of each other, so many entangled knots that I simply gave up. Of course, I knew this was going to happen, because I didn’t work systematically, being a warmup sketch and such. And to be honest, a year ago, I would have been very proud at a result like this. I wouldn’t even have known that I made any mistakes, let alone how to avoid them. At most, I would have noticed that the result looked “odd”. Also a year ago, I would have needed a 2B or even 4B lead, or I wouldn’t have known what I was looking at on the page. I enhanced the contrast of the scan considerably, so it reproduces better on a computer screen (and still it’s rather faint). What has changed is that I’ve started to use a 4H-lead. The marks left behind by such a pencil are so faint, that you must be very aware what you are drawing in order to recognize the image on the paper. With that I mean that by using a faint pencil sketch, I force myself to internalize the original. I can then use that internalized image as my guide, instead of what is on a sheet of paper. Yes, you read that correctly, if you want to draw from life, most of the drawing happens in your mind, not on paper. On paper are just the slight notations and some landmarks. The real story is inside your head. If you want anyone else to understand that story, you need to make it as clear as possible. With “story” I mean “visual impression”. It is hard to explain to non-artists, but I will try to do so anyway. How do you recognize a face? Well, I suppose you don’t really know. You just do. However, take a photo of someone you know and cover the top half. Do you still recognize him or her? You probably do. How is this possible? Aren’t the eyes what makes you recognize someone? You have internalized the missing part. You already know the photo, even if you only got a glance at it before covering the top part. In your mind’s eye you can see those eye, even if your eyes can’t see it, because the top half of the photo is covered. The same goes for drawing. You have drawn so many faces, that you’ve internalized a “standard face”, which you can draw with your eyes closed, so to speak. If you draw someone, you only have to notice in which ways that person deviates from the “standard face”. It’s this deviation you put on paper as an artist in the initial sketch. After all, you want to capture the particularities of a face, what makes it different from other faces. Then you fill in the rest with your knowledge of the “standard face” (what you’ve internalized by drawing so many different faces). A typical beginner’s mistake is to start with the standard face, by using a schematic face they have adopted from a book about drawing faces. While such books are helpful to point the beginner what to look at, it’s no replacement for drawing experience. You need to have drawn a few hundred faces with some effort of trying to make it look like the original. At that point you have some conception of what a face looks like, beyond the point of recognition. Again a stunning revelation for some, I guess. If it looks like the original, if I can recognize who it is, isn’t that enough? Well, it can be. For a mug shot, a composited portrait of a crime suspect, recognition is the only quality that is important. Rendering is kept to a minimum, so people don’t have to interpret the drawing too much. Even so, people are not as good in recognizing strangers, because they try to avoid eye contact. So these composite drawings seem to work best if the suspect is someone you know, someone whose face you have internalized. 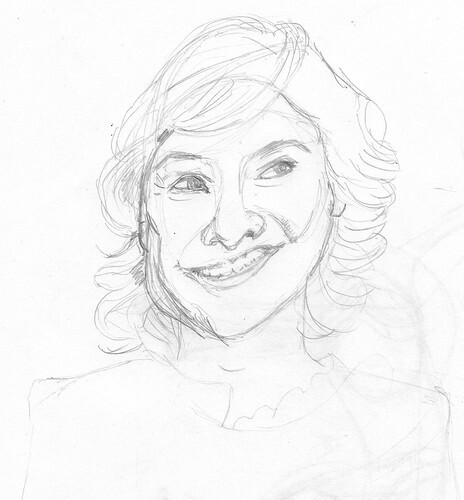 Having a bad memory for faces myself, I don’t care as much about likeness as some do. It’s the structure of a face and the rendering of the features I’m concerned with as an artist. That this happens to coincide with a likeness is a happy accident, if you’d ask me in honesty. So it’s the combination of likeness, structure and rendering that forms the “story” I want to tell with my sketches and drawings of faces. Because I publish my art and know that others care about it, I still need to concern myself with likeness. For most a portrait that doesn’t look like the original is a failed portrait, however “artsy” the drawing might be. My take on it is that putting likeness at the top of the list of things to do in a portrait drawing or painting will lead to stiff art, like the person is consciously posing. If you put it lower on the list and start playing with structure and rendering first, the result will be much looser and satisfying. I guess time will tell if I’m right. Many of my fellow students at my local community college I see measuring with a pencil first and mechanically reproducing a face with some kind of formula. The few who don’t have much looser art, but needed many years (ten or more) to arrive at that point. I have only been drawing seriously since 2009. The only difference is that I don’t put as much value on convention as some seem to do. Some may say that’s a weakness and if that’s true, I’m using that weakness to my advantage. My guess was (and still is) that I keep making the same mistakes over and over again, and that those mistakes are preventing me from getting better at drawing (well there’s some progress). I want to escape “amateur hour” and get more serious about my craft. I picked a photo from my TV guide of Sarah Jessica Parker and decided to stick to it as close as possible, using rather crude tools (4H pencil and Pentel Color Brush pen) for rendering a full body at such a small size (less than 20 cm high). While the end result might not surprise you if you have followed me lately, how I came to this result is what interested me and might interest you too. So I recorded the full 20 minutes drawing session with my iPod Touch on a stand (mic stand with a clamp to hold the mic). In the inking stage my voice becomes very soft, as I’m trying to see the whole picture. I’m sure I’m using both halves of my brain at that stage, preventing me to talk in a normal conversational voice. I’m sorry for that. I guess once my process is more established, I’ll be able to give more attention to talking to you guys and gals. Some observations. Drawing what you see, isn’t literally drawing what you see, but rather observing, reasoning, forming an idea in your mind, and executing that idea. Since that idea can be wrong, it’s important to stay loose in the initial stages. As you can see in the video, I went into detail far too early, and made some wrong assumptions. Furthermore, since inking is permanent, it’s important to form some kind of plan in your mind’s eye, and use the sketch to formalize that plan, containing little reminders and hints of what you were thinking. It’s about how to put something on paper, where and with what line quality. I think sketching should be an important part of the inking, and be used to annotate your though process. It isn’t a rendering, but rather a visual guide for the inking. A sketch is not a drawing, not a finished piece of art. I need to change my attitude to sketching and treat it like the intermediate step it really is. Less is often better, because it’s less confusing for the inker (which is the same person here, but doesn’t have to be). I decided to visit another part of where I live, surrounded by a lot of trees and take my iPod Touch and a few pieces of chalk with me. 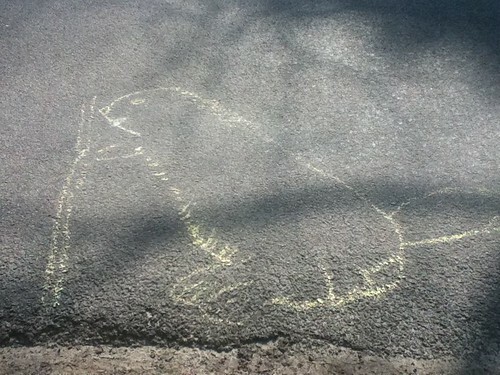 Alas, I didn’t have enough chalk to do all 3 drawings, let alone do more. ⇧ I’m outside of my home town, surrounded by woodlands, so a rabbit seemed very appropriate. ⇧ This one wasn’t really on a sidewalk, but on the road. It’s a beaver, because I was surrounded by forest. 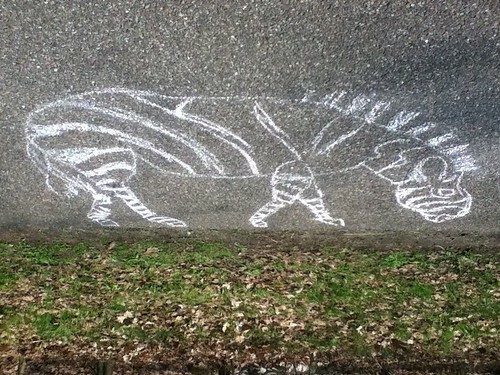 ⇧ I ran out of chalk while drawing this zebra on a road with little car traffic. He is grazing grass, though. 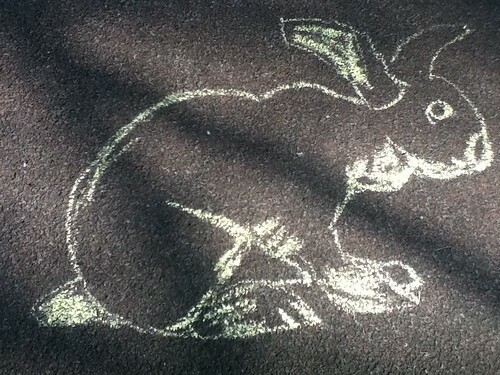 I saw few people, certainly walking by, so this was again an exercise to improve my chalk chops. If nothing else, I had some physical exercise. I’m trying to get better at my art. I hope to impress people when I will be doing it with an audience. Until then, I’m kind of doing stealth drawing, with little or no audience. Practice, you know. ⇧ My first piece of street art of today was not far from where I live, in a city park called after a famous Dutch writer (A.M. De Jong). 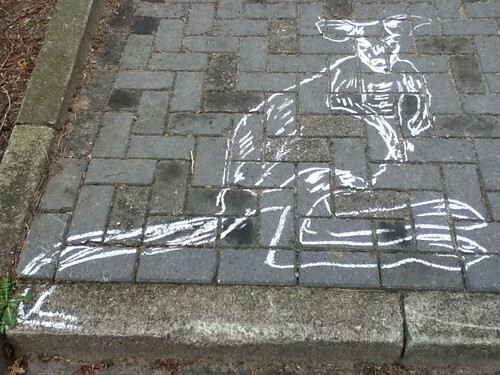 Yes, it’s a kangaroo, apt for the stairs leading to the park itself. ⇧ Here I stood in an outer part of my home town that is still grazed by cows. There might be goats as well. 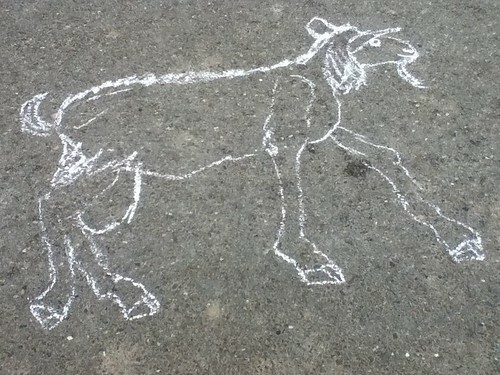 To remember cyclists driving by I drew this goat in chalk. 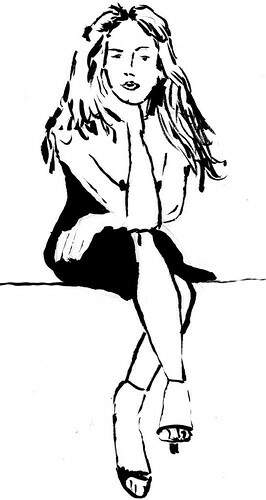 While I was a bit nervous each time I started drawing, I forgot about the initial anxiety once I got into the groove. Art demands full attention!